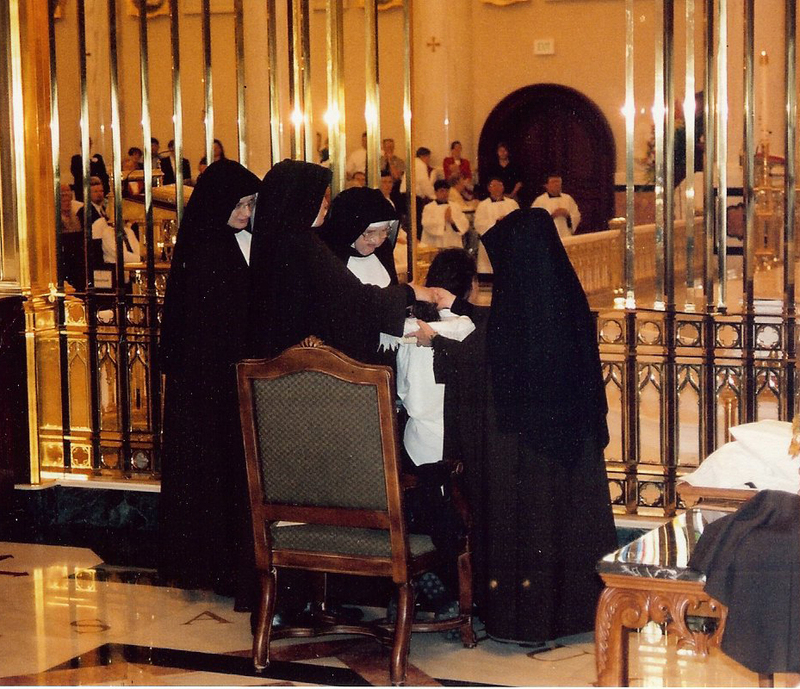 Twelve years ago today Sr. Christine from Atlanta received her holy habit and a new name: Sr. Mary Peter of St. John. Guess you could call this a Throwback Thursday post, although it just doesn’t seem authentic without a mullet. It seems like everyone’s Throwback Thursday posts always involve a mullet. Sort of along the same lines, we bring you instead a bob. That was always one of Rev. Mother’s favorite parts of the ceremony, cutting off our hair with great relish and a huge pair of scissors. At least, they seemed huge at the time. Believe it or not, it usually turned out to be a pretty nice bob. Our Rev. Mother with her smiling new novice. Sorry for the spots on the pictures, guess our scanner needs dusting. 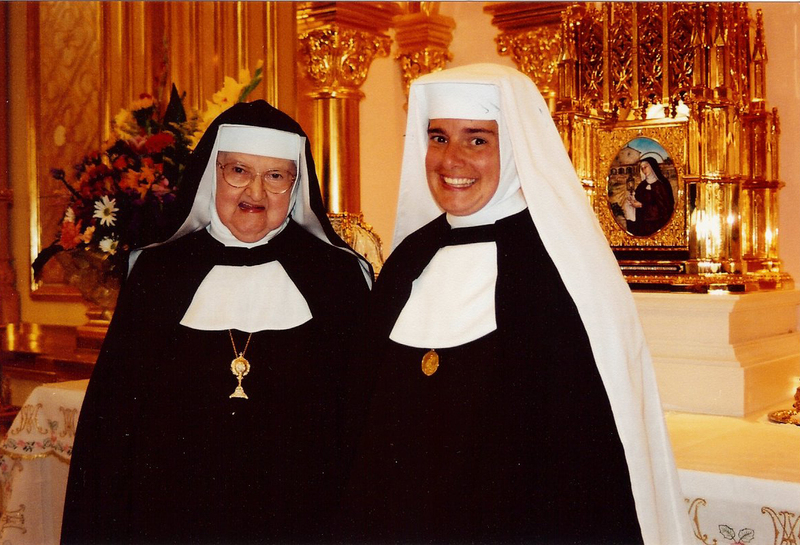 This entry was posted in A Nun's Life and tagged investment ceremony, Mother Angelica, Our Lady of the Angels Monastery, Sr. Mary Peter, St. Joseph the Worker, Throwback Thursday by texasnuns. Bookmark the permalink. Happy Anniversary Sr. Mary Peter!!!! You look so happy!!! God Bless!!! I’m so glad you posted this! I was seriously considering calling you guys on the radio on Wednesday to ask if you cut your hair, since I read that St. Clare cut her hair. Then out of idle curiosity I was thinking about long hair in Texas heat in the summer under a veil and thinking, “they probably keep it short. I would.” Then I became unsatisfied with the length of my hair and gave myself a little home haircut. You see how these things can spiral out of control. Anyway, happy anniversary to Sr. Mary Peter! Happy Anniversary! Mother and you both look so happy! Praying for you both. We love you Sister Peter! the convent has never been the same!!!!!!!! !